Definition at line 28 of file CQReportDefinition.h. Definition at line 34 of file CQReportDefinition.cpp. References C_INT32, FROM_UTF8, CopasiWidget::mKey, mpReportDefinition, setAdvancedMode(), and CCopasiTask::TypeName. Definition at line 60 of file CQReportDefinition.cpp. Definition at line 91 of file CQReportDefinition.cpp. References C_INT32, load(), mAdvanced, mChanged, CopasiWidget::mpDataModel, mpReportDefinition, CReportDefinition::preCompileTable(), CQMessageBox::question(), save(), setAdvancedMode(), CReportDefinition::setIsTable(), and TO_UTF8. Definition at line 467 of file CQReportDefinition.cpp. Referenced by btnCopyReportClicked(), and btnNewReportClicked(). Definition at line 408 of file CQReportDefinition.cpp. References ListViews::ADD, CCopasiVectorN< CType >::add(), btnCommitClicked(), C_INVALID_INDEX, CopasiWidget::enter(), CCopasiVectorN< CType >::getIndex(), CReportDefinition::getKey(), CCopasiRootContainer::getKeyFactory(), CCopasiObject::getObjectDataModel(), CCopasiObject::getObjectName(), CCopasiDataModel::getReportDefinitionList(), CopasiWidget::mKey, CopasiWidget::mpListView, CopasiWidget::mpObject, CopasiWidget::protectedNotify(), ListViews::REPORT, CCopasiObject::setObjectName(), ListViews::switchToOtherWidget(), and TO_UTF8. Definition at line 213 of file CQReportDefinition.cpp. Definition at line 329 of file CQReportDefinition.cpp. 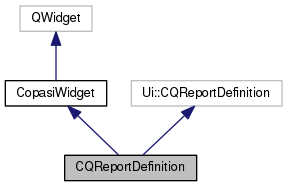 References CCopasiDataModel::appendDependentTasks(), CQMessageBox::confirmDelete(), ListViews::DELETE, CopasiWidget::enter(), FROM_UTF8, CCopasiVector< T >::getIndex(), CCopasiObject::getKey(), CCopasiObject::getObjectName(), CCopasiDataModel::getReportDefinitionList(), min, CopasiWidget::mpDataModel, CopasiWidget::mpObject, CopasiWidget::protectedNotify(), pTask, CCopasiVector< T >::remove(), ListViews::REPORT, and CCopasiVector< T >::size(). Definition at line 291 of file CQReportDefinition.cpp. Definition at line 147 of file CQReportDefinition.cpp. References CQSimpleSelectionTree::AnyObject, CCopasiRootContainer::getDatamodelList(), CCopasiSelectionDialog::getObjectVector(), and mChanged. Definition at line 385 of file CQReportDefinition.cpp. References ListViews::ADD, btnCommitClicked(), C_INVALID_INDEX, CopasiWidget::enter(), CCopasiRootContainer::getDatamodelList(), CReportDefinition::getKey(), CopasiWidget::mpListView, CopasiWidget::protectedNotify(), ListViews::REPORT, ListViews::switchToOtherWidget(), and TO_UTF8. Definition at line 464 of file CQReportDefinition.cpp. Definition at line 178 of file CQReportDefinition.cpp. References CCopasiObject::getCN(), mChanged, and TO_UTF8. Definition at line 194 of file CQReportDefinition.cpp. References CCopasiObject::getCN(), CQTextDialog::getText(), mChanged, and TO_UTF8. Definition at line 254 of file CQReportDefinition.cpp. Definition at line 81 of file CQReportDefinition.cpp. Definition at line 326 of file CQReportDefinition.cpp. Definition at line 72 of file CQReportDefinition.cpp. Definition at line 504 of file CQReportDefinition.cpp. References load(), CopasiWidget::mKey, CopasiWidget::mpListView, CopasiWidget::mpObject, mpReportDefinition, and ListViews::switchToOtherWidget(). Definition at line 493 of file CQReportDefinition.cpp. Definition at line 521 of file CQReportDefinition.cpp. References FROM_UTF8, CReportDefinition::getBodyAddr(), CReportDefinition::getFooterAddr(), CReportDefinition::getHeaderAddr(), CCopasiObject::getObjectName(), CReportDefinition::getPrecision(), CReportDefinition::getSeparator(), CCopasiStaticString::getStaticString(), CReportDefinition::getTableAddr(), CReportDefinition::getTaskType(), CReportDefinition::getTitle(), CReportDefinition::isTable(), mChanged, mpReportDefinition, and setAdvancedMode(). Referenced by btnAdvancedClicked(), btnRevertClicked(), enterProtected(), and update(). Definition at line 66 of file CQReportDefinition.cpp. Definition at line 78 of file CQReportDefinition.cpp. Definition at line 589 of file CQReportDefinition.cpp. References C_INT32, FROM_UTF8, CReportDefinition::getBodyAddr(), CCopasiObject::getCN(), CCopasiRootContainer::getDatamodelList(), CReportDefinition::getFooterAddr(), CReportDefinition::getHeaderAddr(), CCopasiObject::getObjectName(), CReportDefinition::getTableAddr(), CQMessageBox::information(), mAdvanced, mChanged, CopasiWidget::mKey, mpReportDefinition, CopasiWidget::protectedNotify(), ListViews::RENAME, ListViews::REPORT, CReportDefinition::setIsTable(), CCopasiObject::setObjectName(), CReportDefinition::setPrecision(), CReportDefinition::setSeparator(), CReportDefinition::setTaskType(), CReportDefinition::setTitle(), and TO_UTF8. Referenced by btnAdvancedClicked(), btnCommitClicked(), and leave(). Definition at line 75 of file CQReportDefinition.cpp. Definition at line 685 of file CQReportDefinition.cpp. Referenced by btnAdvancedClicked(), CQReportDefinition(), and load(). Definition at line 69 of file CQReportDefinition.cpp. Definition at line 470 of file CQReportDefinition.cpp. References ListViews::ADD, ListViews::DELETE, load(), CopasiWidget::mIgnoreUpdates, CopasiWidget::mKey, ListViews::MODEL, mpReportDefinition, and ListViews::REPORT. Definition at line 45 of file CQReportDefinition.h. Referenced by btnAdvancedClicked(), save(), and setAdvancedMode(). Definition at line 46 of file CQReportDefinition.h. Referenced by btnAdvancedClicked(), btnDeleteClicked(), btnDownClicked(), btnItemClicked(), btnSeparatorClicked(), btnTextClicked(), btnUpClicked(), chkTabClicked(), chkTitleClicked(), commentChanged(), load(), nameChanged(), precisionChanged(), save(), separatorChanged(), and taskChanged(). Definition at line 48 of file CQReportDefinition.h. Definition at line 47 of file CQReportDefinition.h. Referenced by btnAdvancedClicked(), CQReportDefinition(), enterProtected(), load(), save(), and update().